As engineered systems have become complex they have begun to push the limits of the materials from which they are made. An oft-recurring engineering challenge is to design materials for stronger and lighter performance at elevated temperatures. The thermo-physical properties of materials are often at odds: higher temperature materials like ceramics can be prone to cracking when stressed and metals (such as aluminum) can lose strength as they anneal under thermal loads. CMI has combined the high structural efficiency of its Periodic Cellular Materials (PCMs) with a two-phase, passive heat transfer device known as a heat pipe. These structures are capable of transporting heat more than ten times faster than solid metals. The concept is based upon the evaporation of a source that sets up a region of elevated pressure in the sealed system. The latent heat of evaporation is transported down the pressure gradient as a vapor stream until it condenses at cooler regions. There it releases the latent heat at a location well suited for removal. Replenishment of the condensed fluid to the evaporator region is driven by a liquid pressure gradient in a saturated, porous wick which lines its walls. 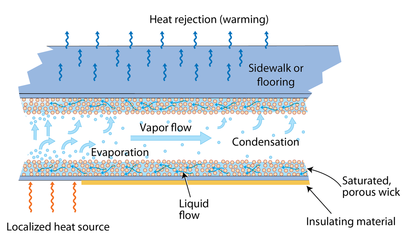 The evaporation, vapor flow (heat transport), and condensation of the working fluid isothermalizes the structure which can significantly lower maximum temperatures. The open core of CMI’s PCMs enables heat transport while simultaneously supporting structural loads. Through proper material selection and design, extremely large heat fluxes can be driven down a heat pipe with only small temperature drops along its length; effective thermal conductivity can reach several thousand W/mK. It is this high effective thermal conductivity which opens the design envelope for structural metallic materials in hostile thermal environments. CMI’s systems have been successfully demonstrated as jet blast deflectors designed for use aboard U.S. Navy ships. CMI is currently evaluating a deck thermal management system designed to support the U.S. Navy’s vertical take-off and landing (VTOL) aircraft. It is believed to be the world’s largest vapor chamber for thermal management. Related work done by CMI staff members and Haydn Wadley.